East Coast Photo, online at eastcoastphoto.com, is your source for all Digital Photography, cameras, lenses, and photographic accessories. 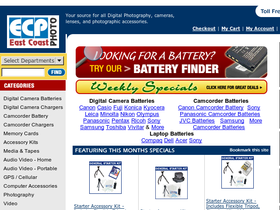 At East Coast Photo find digital camera batteries, camcorder batteries as well as battery charges and laptop batteries. East Coast Photo offers countless quality products including memory cards, accessory kits, binoculars, video games, camera cases and so much more. Choose from select popular brands including Canon, Casio, Fuji, Konica, Kyocera, Leica, Minolta, Nikon, Olympus, Panasonic, Pentax, Ricoh, Sony, Samsung, Toshiba, Vivitar and many more. So check out what East Coast Photo has for you but first stop by RetailSteal to find the best East Coast Photo coupon codes, East Coast Photo promotions, and East Coast Photo discounts. At East Coast Photo get free ground shipping on a large list of specified products. For other orders choose from UPS Next Day, UPS Next Day Air Saver, UPS 2nd Day Air, UPS 3 Day Select, or UPS Ground all for different rates. Shipping is done to the 48 contiguous states and other locations depending on the shipping method selected. See website for full details, exclusions may apply. Check out the weekly specials at East Coast Photo and save up to 70% on merchandise. Shop the clearance section at East Coast Photo and receive a discount of up to 40%. Save up to 55% on weekly specials at East Coast Photo. Click link for savings. Visit East Coast Photo and check out the amazing prices on Lowepro products, with camera backpacks starting as low as $8.95. At East Coast Photo, buy select Nikon replacement batteries for as low as $13.95. Click link to purchase. Shop at East Coast Photo and enjoy free shipping on most items online. Print your memories online with RitzPix and enjoy 9-cent 4x6 prints with this coupon code. Check out RitzPix and take advantage of free 1-hour store pick up. Act now and enjoy a 60% discount on an 8x6 photo book from RitzPix. Use coupon code at checkout to save. Use this coupon code online at RitzPix.com and enjoy a 50% discount on photo cards.